Mixing is becoming increasingly important in a wide array of processes. Today's products are often comprised of a multitude of ingredients, such as stabilizers, thickeners, gums, sugars, and other additives. This offers a challenge to provide a consistent blend quality as efficiently as possible. 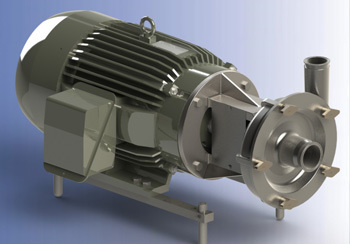 To meet this challenge, Ampco has developed three types of shear blenders that are based on their popular LF platform. This means more shared wear items for more of your equipment, and easy piping solutions to boot. The wide range of mechanical seal materials (both single- and double-mechanical) and elastomers from the LF line are also available to fine-tune a shear blender to the needs of a particular process. The SB shear blender offers flexibility for a variety of products. The clearance of the SB shear blender can be adjusted with the use of provided shims to achieve precisely the blend quality desired. The SBH shear blender maximizes shear-area by having several rows of rectangular teeth that mesh with each other at close clearances. This is the best blender for improving process time when the highest shear is desired. The SBI shear pump moves the product with considerable capacity and pressure capabilities. This is achieved through a hybrid design, consisting of a fine-tuned impeller paired with two rows of rectangular shear teeth.